After four games with the Nashville Predators, the team returned top prospect Eeli Tolvanen to the AHL’s Milwaukee Admirals on Dec. 13. The team recalled him from the Admirals on Dec. 1 and he tallied one goal and one assist while averaging 13:16 of ice time per game, including 11:49 at even strength per game. While he produced with the Predators and skated on the team’s second line, he was also a healthy scratch on Dec. 8 against the Calgary Flames. In his stint with the Predators, Tolvanen showed why scouts loved him ahead of the 2017 Entry Draft and why the team was excited he fell far enough for them to use the 30th overall pick on him. He also showed glimpses of what’s to come and how he can become an entrenched player in the team’s top-six. However, despite those positives, the team’s decision to return him to the AHL is still a good thing as well as the proper move for his development. Although Tolvanen appeared in three games at the end of 2017-18 after his KHL season concluded, it was never a guarantee he would be on the Predators’ opening night roster. So when the team announced they were sending him to Milwaukee before the team broke training camp, fans who wanted to see him in Nashville felt the move made little sense, and I was one of them. Yet when head coach Peter Laviolette explained that the decision was made in response to the Predators not having room in their top-six and he didn’t want Tolvanen to be a healthy scratch or play on the fourth line, the demotion was justified. It’s my feeling that the team’s goal was to keep him in the AHL the majority of the season before considering a call-up for the playoffs. As a 19-year-old, he was one of the youngest players in the NHL and needs time to get accustomed to playing professionally in North America. Keep in mind, this is also a player who was playing for the USHL’s Sioux City Musketeers two seasons ago before returning to his native Finland to join Jokerit of the KHL where he played on the wider international ice rinks. He needed, and continues to need, time to play in a setting that is largely unfamiliar to him so that when a top-six role is available with the NHL club, he can transition smoothly. However, that plan went by the wayside when injuries began piling up for the Predators. 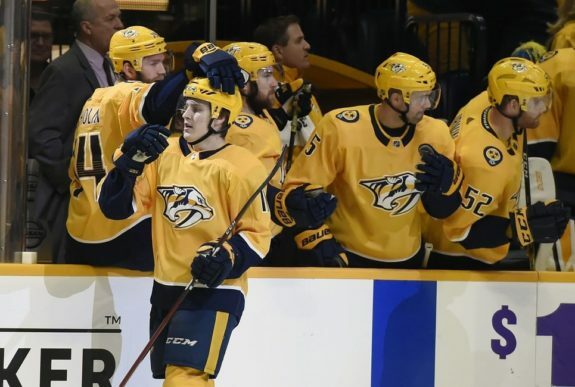 When Viktor Arvidsson, Filip Forsberg, and Kyle Turris found themselves on injured reserve, the team needed someone to serve an offensive role in their absences, therefore necessitating Tolvanen’s call-up. In his four games, Tolvanen played fairly well. Of his two points, his goal was scored at even strength while his assist came on a Craig Smith power play goal. He was able to make an impact and looked comfortable on the ice and the metrics support these claims. At five-on-five, the team had a 61.7 Corsi For percentage and controlled 60 percent of shots, 100 percent of goals, 61.8 percent of scoring chances, and 53.3 percent of high danger chances with him on the ice. In all situations, he generated eight individual scoring chances, including two at high danger, and had three takeaways against one giveaway. He also didn’t take any penalties. He essentially took Turris’ spot on the second line alongside Calle Järnkrok and Craig Smith with Järnkrok centering the trio. When together at five-on-five, the line controlled 60.6 percent of shots, 60.6 percent of scoring chances, and 53.3 percent of high danger chances. Laviolette also gave Tolvanen advantageous zone starts to provide him with the most opportunities possible. For example, he averaged 1:27 of power play time per game. He also started in the offensive zone 42.9 percent at five-on-five while starting in the defensive zone 16.3 percent. That extreme of a zone start split shows how important it was for the team to insulate him and further supports the need for him to return to the AHL. Because he had directly taken Turris’ spot in the lineup, it only made sense for Tolvanen to be sent back to the Admirals once Turris was healthy. So when Turris returned on Dec. 13 against the Vancouver Canucks, that’s what happened as Turris reclaimed his spot on the second line. With the second line solidified and it unlikely that the Predators would use Tolvanen on the first line with Ryan Johansen, it only made sense for him to return to Milwaukee. Once again, with no top-six role available, it wouldn’t have made sense to keep him in the NHL to play a bottom-six role. He is too talented for that, plus it would have been a waste of his skillset and would have hindered his development. There’s also validity to sending him back due to the downward trend in recent games. He may have accumulated two points in his four NHL games, but both occurred in his first game against the Chicago Blackhawks on Dec. 1. He also hadn’t attempted a shot since that game, when he had two shot attempts, and had played just over 11 minutes in his final game while Järnkrok and Smith were both over 15 minutes. Tolvanen didn’t even play against the Calgary Flames on Dec. 8, most likely due to the Flames being a physical team and Laviolette not wanting to expose him to that style of play this early in his career. Again, as I mentioned earlier, the team insulated him. Had he remained in the NHL, his opportunities would have been limited moving forward. Meanwhile, in the AHL, his opportunities may be limitless. Instead of playing the 11 to 15 minutes he played with the Predators, he should be able to average between 18 and 20 minutes per game in the AHL. He will also get top power play time, all while continuing to develop and getting accustomed to playing in the Predators’ system. There’s also merit to the fact that the Admirals need Tolvanen. He may only have four goals and 11 points in 21 AHL games this season, but he is a vital part of the team’s offense. While he was in the NHL, the Admirals went 2-2-1 and scored two or fewer goals in three games. Now that he’s back in the AHL, will we see him at the 2019 World Junior Championship? 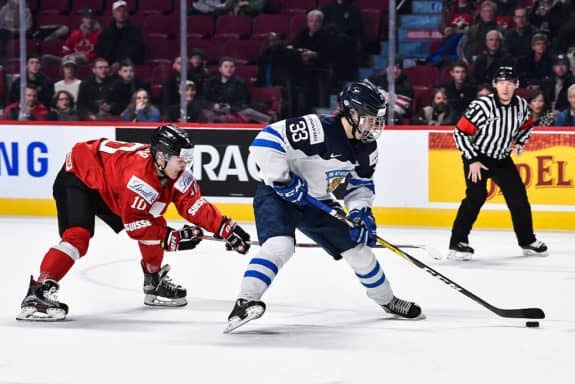 He is clearly talented enough to represent Finland at the tournament for the third straight year, but was in the NHL when the nation announced its selection camp invites. 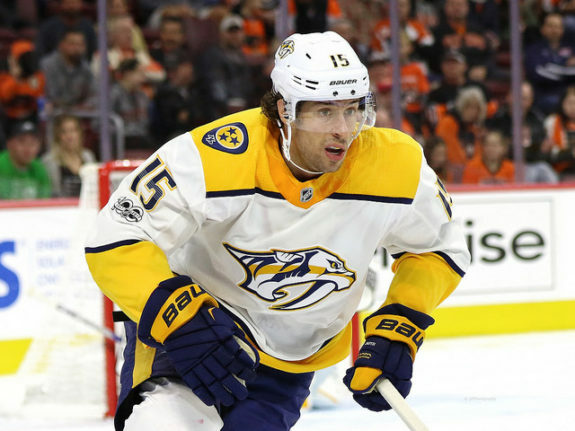 Had he remained in the NHL, there was almost no chance the Predators would have let him participate, but now that he’s in Milwaukee, the possibility of him playing in the tournament arises again. Will We See Him in the NHL Again This Season? Without another plethora of injuries like the Predators just experienced, it’s hard to tell whether or not he’ll be in the NHL again this season. The fact remains that it still won’t make sense for him to be called-up just to play in the bottom-six. There is always a chance the team recalls him for the NHL playoffs if the Admirals don’t reach the postseason or are eliminated. He could be used to provide the depth offense teams look for in the postseason. But even if he doesn’t play in the NHL again this season, it will be okay. He is only 19 years old and doesn’t turn 20 until April. By comparison, Calder Trophy front-runner Elias Pettersson is already 20 and Colin White, in second place in the rookie scoring race, is 21. Tolvanen is hardly a bust just because he isn’t a steady NHL presence, but it’s easy to get excited and think about what could be given his performance in the KHL last season. The Predators shouldn’t and, in my opinion, can’t trade him unless it would have meant acquiring William Nylander or someone of his caliber. Parting with Tolvanen would mean stripping down the team’s farm system even more than it already is. They need to remain patient with him and allow him to develop in the AHL where the pressures of the NHL aren’t present. The team returning him to Milwaukee provides him with that opportunity.